“Mom knows best”, that's how the saying goes, and when moms are asked what an ideal event for their children would be, every mom would definitely say, “something informative yet fun to keep their attention.” So moms, check this out! Expo Kid is a venue where learning meets fun! It is an event conceptualized not only for kids but is also a worthwhile affair for moms and dads to discover things that their kids can enjoy and learn from. At Expo Kid, there will be interactive activity areas, all-day talks and demos, and a Kids' Bazaar featuring more than 30 vendors and exhibitors. Expo Kid features some of today’s most creative and dynamic kids activity providers such as Kids Ahoy!, My Masterpiece and Kiddieparty.com. Onstage activities will showcase a YogaKids demo, Science Exploration workshops, a Bumblebee fashion show of the coolest kids costumes, the ArtBeats musical band, a great balloon show by Jiggles the Balloon Lady, and a lot more! Expo Kid is organized by Rome Kanapi of the Philippine Association of Childbirth Education (PACE) and Janice Crisostomo-Villanueva of Mommy Matters, the same team who has been organizing much-awaited events for moms and families such as Expo Mom, Mommy Milkshake Marathon and Moms on the Floor. 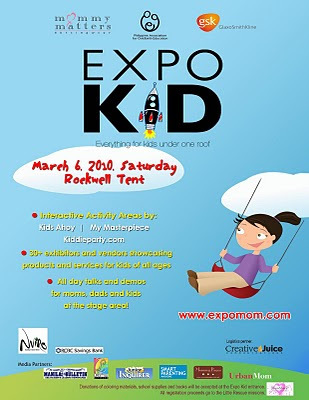 Expo Kid is on March 6 (Saturday) at Rockwell Tent. The event will start at 10 in the morning until 8 in the evening. An entrance fee of 25 pesos per person shall be charged, with all registration proceeds going to MomShare’s beneficiary, the Kids Ahoy Little Rescue Mission. Donations of coloring materials, school supplies, books and the like will be accepted at the gate. Kids below 12 years of age get in for free. For more info, log on to http://mommypages.com.ph or search Expo Kid on Facebook. This event is brought to you by Mommy Matters, PACE, GlaxoSmithKline, NVIRO Paints, RCBC Savings Bank. With support from media partners Manila Bulletin, Junior Inquirer, Lifestyle Network, Mommy Pages, mommypages.com.ph, Smart Parenting Magazine and Urban Mom. Logistical Management by Creative Juice. Special thanks to Ms. Janice Villanueva of Mommy Matters for the heads-up! thanks for the heads up... i think ill repost this at my site too, is it ok? yes, of course Mommy Chris! thanks! Hey Mauie! THANKS SO MUCH for helping us promote Expo Kid! So excited for the event already! hope to see you and meet you there! :) Thanks again!